No one wants to be reminded that they had acne as a teenager. Severe cases of acne often leave permanent reminders—acne scarring—where skin is pitted where the acne damaged the underlying pores and skin tissue. Mild acne would be a sprinkle of pimples, blackheads or whiteheads. Moderate acne means more pimples, larger in size and red. Acne tends to cluster on cheeks, jaw line, chest, and back, but can be anywhere on the body. Severe acne pustules dig deep into the skin, stretching pores and distorting the underlying tissue. 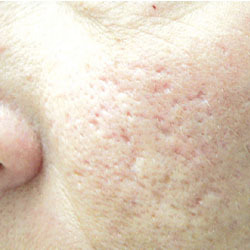 Acne scarring is the result of this distortion of tissue. Other causes of scarring include irritating the pustules by picking at them, which may cause infection, hence the angry red color. It’s important to control acne before scarring occurs, if possible. One popular preparation to control and clear acne is benzoyl peroxide. Benzoyl peroxide comes in different strengths ranging from 2.5% to 10%. Generally higher percentages only cause more irritation and do not provide any better results, so it is better to stick with a low percent. BP speeds cell turnover (or peeling) inside the follicles and outside, which allows damaged skin to be replaced faster with new skin. When first starting with benzoyl peroxide, it’s best to use lower concentrations to avoid irritating the skin further. Irritation can cause acne pimples to break, which will cause more scarring later. It’s best to avoid an aggressive treatment if acne is mild to moderate. If acne is severe, a more aggressive approach is needed. Chemical peels rid the skin of acne and can yield good results in clearing acne. Chemical peels will remove the upper layers of the skin, which takes the acne scarring down, making it less noticeable. Even with a mild chemical peel, like Jessners, the skin may still have noticeable scarring. If the damage is already done, there are ways to minimize the appearance on the skin. Abrasive scrubs may seem like the way to go, but avoid them as they cause further damage to skin that is already distressed. For light acne scarring, a product like retinol-A or alpha hydroxy can help smooth out the skin. Chemical peels strike fear in some people with visions of acid being used to burn the skin off. Many chemical peels are made from natural acids found in fruit, such as: citric acid, glycolic acid, and lactic acid. Some peels contain alpha hydroxy acid, salicylic acid, and beta hydroxy acids. Some peels have faster results but can only be done by a dermatologist or plastic surgeon. All chemical peels work in the same way. They remove the top layers of the skin, which allows undamaged skin underneath to be exposed. The removal of dead skin forces new skin growth. New skin has better elasticity and turgidity and replaces the loosened skin that resulted from acne scarring. New skin has better blood flow, which will give the damaged area a more natural glow. The skin will continue to improve each time a chemical peel is done. Chemical peels can be done bi-weekly for all the AHA and BHA acids. Only TCA or Jessners would require a longer time period between peels, usually between 3 - 4 weeks.